Traveling to Rome? The Eternal City is waiting in all its mystery and allure. Grab and retain the most essential Rome travel tips and facts to make your visit an iconic one. Whether a first-time visitor or a frequent city guest, Rome will surely please you with its haunting “Belleza” and will ignite your interest in every artistic heritage covered in the city walls. Hence, asking your full attention while introducing you some basic Rome travel tips and tricks. 1. There is one indisputable fact about Rome. Every eatery in here is a book of delicacies. You can try out every tiny restaurant in the city corners and get an unforgettable experience. Here are some of the top ones which offer Italian food. 2. Despite the tasty food, the Rome restaurants offer low prices. Isn’t it great? 3. Follow my first tip and eat whenever and wherever you can. However, keep in mind the local culture and traditions. If you are an “early” eater, from 6 to 7 p.m, you will find most of the restaurants closed or empty. The Italians usually have their evening meal at 7-8 p.m. and leave at nearly 11 p.m.
4. Last but not least, the city’s magical “GELATO” is not to be missed. 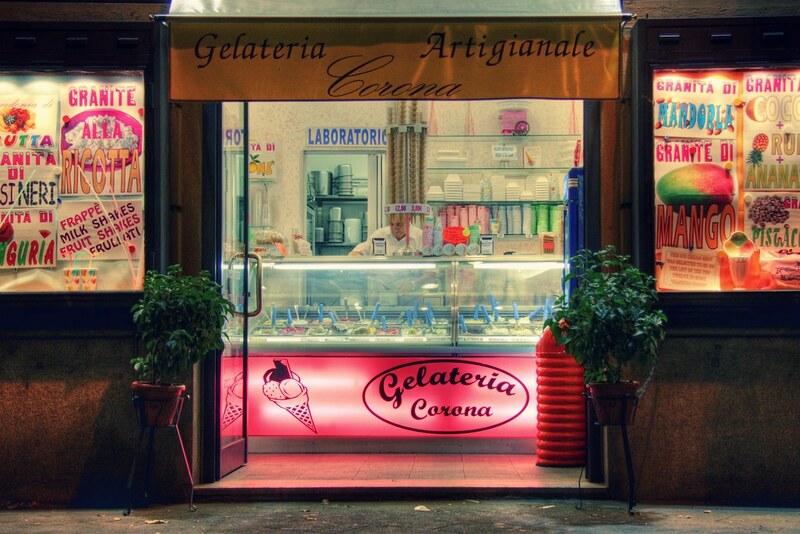 Find the best homemade ice-cream at Rome gelaterias savor their variously flavored concoctions. 5. Traveling to Rome and having a typical Italian meal without wine is a tough sin. Try out the local house wines as they are truly delicious. There is no second opinion. You will get the same answer from every visitor to Rome. 6. Rome is a huge city and wasting time may be a lifelong pity. There’s too much to see and discover. With a 2-day stay in the town, you will find yourself in an endless hurry and rush and will leave a bunch of new things unseen. Rome is a library of attractions, and a smart planning is a must to manage your time efficiently. So, contribute at least 4 days to Rome to grasp the city’s core spirit and to uncover its mysteries. Find a perfect itinerary with our Rome Trip Planner. 7. The velvet season for Rome is in April, May, and late September through October. Avoid the city in August, when everybody is out on vacations, and the active hub is emptied. Follow the Rome travel tips to save your time and money on the transport. 8. To go to the Fiumicino airport there are 3 options. You can take a train to arrive at Station Termini which is in the city downtown or the reverse line to go to the airport. It will cost you $12 per person. The other option is to take a shuttle bus for nearly $15, but there might be unpredictable traffic. However, if you are loaded with a number of suitcases, a better option is to take a taxi cab or a hotel pick-up for around $50. 9. Taxi is a major issue in Rome. It is nearly impossible to find taxis in the center, and even if you are the luckiest to see one, it will never stop by. So, save your time and money and take the handy metro. A one-way ticket costs less than a dollar, but there are also tourist tickets called BIT and CIS with unlimited rides. BIT “Biglietto Turistico Integrato” is a 3-day ticket, valid until midnight of the third day on which the ticket is validated, the CIS “Carta Integrata Settimanale” is a weekly one. Both BIT and CIS grant you unlimited rides on Atac or Cotral buses, subways, and some local trains. 10. When in such a touristy spot as Rome, endless queues are always a significant trouble. You will find them at every attraction in the city. Prior reservation is foremost for Vatican, where you can get an easy access just by showing the ticket voucher. Hence, a better option is to book or buy all the tickets online in advance. Skip the line and plan your time effectively to get most out of the city. 11. Must-know Rome travel tips are, as well, the practical pieces of advice given by the travelers. For instance, a common knowledge for Rome visitors is when in Colosseum, it is better to take the Palatine entrance, where lines are shorter. 12. As the heart of the Roman Catholic Church and home to more than 900 churches, Rome, and especially the Vatican has a particular dress code to perceive. Have the courtesy to follow the rules of covering your arms and legs before your entrance otherwise your admission will be refused. 13. Roma Pass is also another card creates to help the tourists and motivate them to visit and discover Rome. The card has multiple advantages: transport, two museums free of charge and reductions for all other museums and major events in Rome for a 3-day pass. 14. One of the must-know Rome travel tips is about the right way of exploring the city. Rome is a city to discover by walking. Avoid queuing in traffic and better walk along the city streets on your own. You can take a city map from the hotel or tourist office and make necessary notes to it. 15. Follow The List Of The Rome Top Attractions And Be Sure To Include Them In Your Plan. 16. The first Romans were not Romans and if you want to see the Ancient Rome’s real location, there are day trips to the town of Castel Gandolfo on the shore of Lake Albano. 18. Nearly 700,000 euros worth of coins are tossed into Rome’s Trevi Fountain each year. 19. Rome became the capital city of unified Italy in 1870, taking the title from Florence. 20. One of the most interesting Rome travel tips and facts is that women in ancient Rome dyed their hair with goat fat and beech wood ashes. The most popular colors were red and blond. 21. St Peter’s Basilica inside Vatican City was the largest church ever constructed after Basilica of Our Lady of Peace of Yamoussoukro construction. 22. Rome has approximately 2,500 public fountains, and you can drink from them. 23. It is estimated that Rome is home to approximately 300,000 cats and they have special rights. 24. Rome is the most photographed city in Europe and the second most photographed in the world, after New York. And a final point not to miss. The best of Rome travel tips; do not miss the opportunity to confess love and to give air to your emotions in the most romantic city in the world.